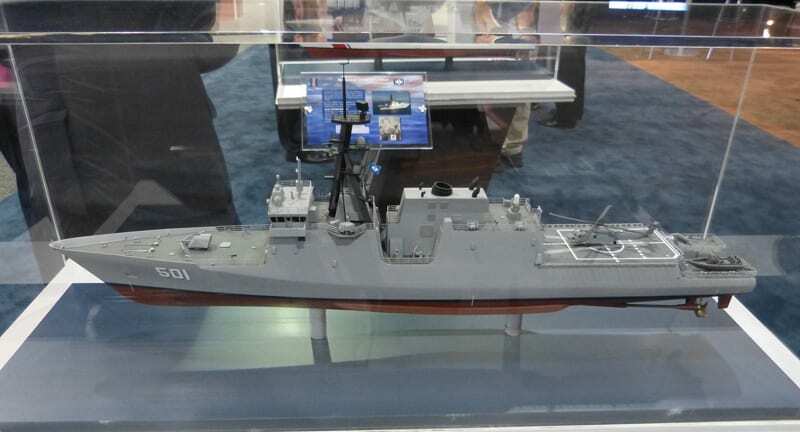 Since it was reincarnated from its 2008 Northrop Grumman National Security Frigate avatar by Huntington Ingalls Industries (HII) and rolled out at the Surface Navy Association’s annual meeting in January, HII’s Patrol Frigate concepts appear to be gaining some traction on the international marketplace. Unlike previous attempts to market this design, HII is now offering two Patrol Frigate concepts based on its proven U.S. Coast Guard National Security Cutter (NSC) design. One is the PF 4501 – essentially a gray version of the while-hulled NSC with minimal modifications. The key external change is a modified stern launch and recovery ramp for a RHIB. The other, PF 4921, features a more extensive set of changes – primarily in its combat systems. Around 70 percent of the ship design is to Naval Vessel Rules (NVR), according to HII. Speaking at the just concluded U.S. Navy League’s Sea Air Space Expo 2012, Michael Tangora, who is the Coast Guard’s head of acquisition services and deputy chief acquisition officer, said that Brazil, Saudi Arabia and, somewhat unexpectedly, Germany have expressed an interest in this design. HII says, without elaborating further, that there are aspects of the design that are of interest to the German navy. HII showcased the concepts at the Pacific 2012 International Maritime and Naval Exposition with an eye to the Australian and Asia Pacific offshore patrol vessel (OPV) and frigate market. The company projects the potential market for this type of naval vessel to be around 215 hulls over the next 20 years, mostly in the Asia-Pacific region, according to Mike Duthu, who manages the NSC program at HII. Both designs share the hull form and propulsion system of the NSC. Principal dimensions are a length of 418 feet/127.4 meters, a beam of 54 feet/16.5 meters, a draft of 22 feet/6.7 meters and a displacement of 4,600 metric tons. The NSC’s flexible CODOG propulsion system, with one LM 2500 gas turbine and two MTU 20V 1163 diesels, permits twin-screw operations with any one of the three engines if required. Top speeds are 18 knots on one diesel, 24 knots on two diesels and 28+ knots with all three engines online. Cruising speeds are in the 9-11 knot range. In March, HII exhibited the Patrol Frigates at DIMDEX in Qatar with an obvious eye on the lucrative Middle Eastern OPV and frigate market. The well-known naval market research firm, AMI International, estimates the future regional market in this segment at US $7.6 billion, representing 22 OPV hulls at about $800 million and 26 light frigate type hulls at about $6.9 billion. The PF 4501 is an OPV that has a range of 12,000 nautical miles and an endurance of 60 days. Weapons and sensors are similar to the NSC, with a Bofors 57 mm main gun, six machine guns, and a Phalanx close in weapons system (CIWS). Sensors include a 3D radar and optronic systems. The ship can launch two SH-60 sized helicopters or one helicopter and an unmanned aerial vehicle (UAV). The PF 4501 has a bow thruster – a feature that the PF 4921 lacks. Ship’s complement is 148 persons. On the other hand, the PF 4921 is a light frigate for executing anti-air, anti-surface and anti-submarine warfare. However, it sacrifices range – which is about a third less than the PF 4501 – for vastly enhanced combat capabilities. Armament is a 76 mm main gun, a vertical launch unit for the evolved Sea Sparrow Missile (ESSM), a Phalanx or SeaRAM CIWS, and six crew-served as well as remotely operated machine guns. Mounted aft are two quad packed Harpoon surface-to-surface missile launchers and a triple torpedo tube launcher. Sensors shown on the concept ship include a CEAFAR radar system, a hull mounted sonar and a towed array sonar system. Ship’s complement is 141. With the Patrol Frigate concepts, HII hopes to leverage the stable design baseline of the NSC and a “hot” construction line with an experienced workforce at its Pascagoula yard to offer potential customers an affordable solution for their OPV as well as frigate requirements. “Both 4501 and 4921 can handle a wide variety of missions. There is a tremendous amount of capability in the ships. The range and endurance provides extended on-station presence for patrol and critical missions, the propulsion plant provides a great deal of flexibility, the large flight deck can accommodate a wide range of helicopters, and the habitability features are outstanding. 4921 has some enhancements allowing it to take on additional operations for ASW, ASuW, AAW, and mine warfare,” explains Duthu. “We would certainly be open to talking with various customers should they elect to alter the weapons and sensor suite,” says Duthu, although HII would not disclose figures, stating that it would be premature to speculate on the price without further definition of the many variables that determine the price of a ship, such as the configuration, volume, timing, contract type, and individual customer requirements. What if this not a comment, but request? Can I ask for high res pictures of PF 4501 and 4921 models shown here? I’m afraid I don’t have an immediate answer. Prices for the NSC range between $500 and $750 million per vessel, but those figures usually include development costs spread across the entire buy. You could subtract those development costs from the 4921, but you would have to add in the costs of adding the weapon and sensor systems, enclosing the stern, etc. It’s very hard to say, but HII circulated a study showing operational costs would be lower than for an LCS, which would lead me to believe the acquisition costs per unit must be very similar, else those would be touted instead of lower operational costs.